I am working with a school this year around the theme of food. My mum is the queen of altered books and I've always meant to do one myself. This summer after we left America, my mum got my sister and Molly and Freddie making altered books. They loved this process and way of creating, so when I started to think about how I would embed journals in a year 3 or year 6 class, I wondered if this would be the time to experiment with the altered book form. Alison, the teacher who I work with primarily at the school, was keen so, for the past week I've been considering the possibilities and have taken over the kitchens to play with altered books and the theme of food. While in Warwickshire last week I dragged Hudson and Patrick around antique shops and found a few food books with illustrations that I thought might inspire me. In the end I decided to use the less exciting book entitled 'Deep Freezing' as my trial. I got out the books on altering that I have and then (in my impulsive way) just started. I am certainly not an expert in this process: pages are bumpy - Gu doesn't work as well as PVA and Pritt Stick is less reliable (I think), I got ink all over the pristine cover, and some pages need more work... But it has been fun and I have made about 40 pages of backgrounds. I'm sure that's not the way most people work, but it's the way I began. I want this altered book to be a teaching tool. I want the teachers and young people to see into my often messy and chaotic process so they can find their own way of working. - spend a few minutes writing down a list of memorable meals. (I actually said 30 seconds to Hudson and Patrick because they were in a hurry but then didn't STOP them until about 2 minutes had passed - they would have gone on writing). I suggested that they just write a few words for each memory but also that they try to evoke what was special about the meal. Hudson, Patrick and I managed to list 8-12 memorable meals. They weren't all really meals, some were events linked to foods, BREAK RULES. - I asked them to read the list back to the group and then to choose one and tell us some of the detail of why it was memorable. I recorded these and the left hand page is Hudson's story as told to me. Hudson looked through my book and chose the page that 'spoke' to him. The words 'Eskimo' and 'snow' that were visible through the altered page helped Hudson to locate his story (food after a mountain trek). I typed it up the story as he had told it me and printed it onto canvas. The right hand page is my story about a papaya tree in Kenya. There is a little envelope and inside the envelope you find the story. The butterfly is the butterfly that is common in the Kerio Valley and it turns out it pollinates the papaya. I learned something as I created the page. Would you like to contribute? 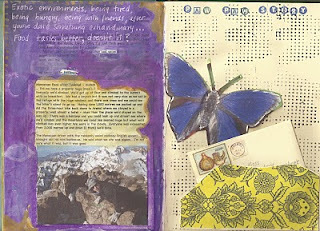 I would love to capture and respond to your story in my altered book. i will be sharing these with the children at East Bergholt School who I will be working with soon. They will be inspired to make their own altered food story books! Thanks in advance. I will post all pages. I'm enjoying your posts! Some great inspiration. Have a happy, creative 2013!